These are exterior shots of my former MAC65 taken at various times. 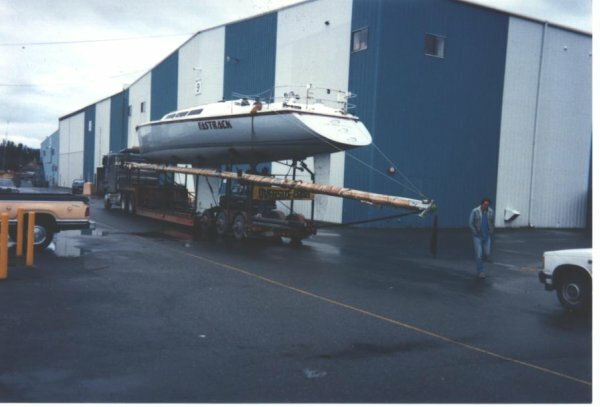 While the boat has been recently sold my incredible memories prompted me to gather some pics together. For pictures of the interior Click Here. 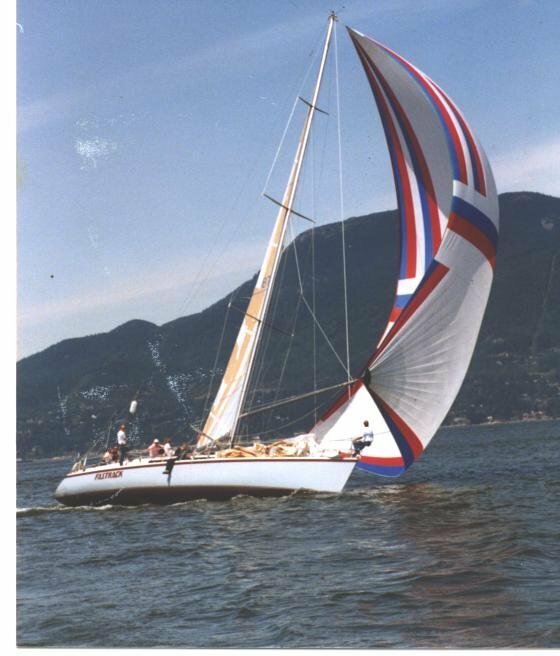 I already had a Hunter Vision 32, a nice sailing inshore boat with an unstayed mast. 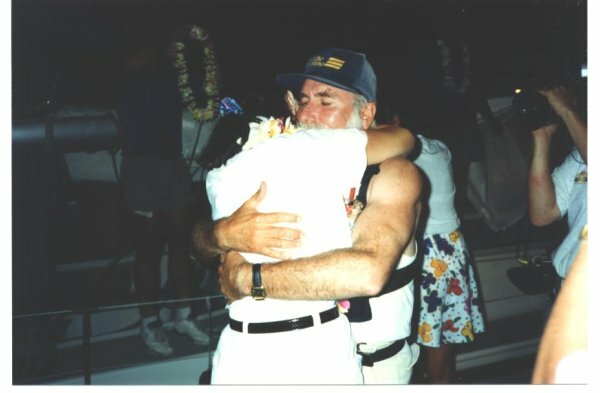 In 1991 a 79 year old guy at False Creek Yacht Club wanted to do, for his 80th birthday, the 2400 nautical mile race from Victoria BC to Maui in the Hawaiian Islands. 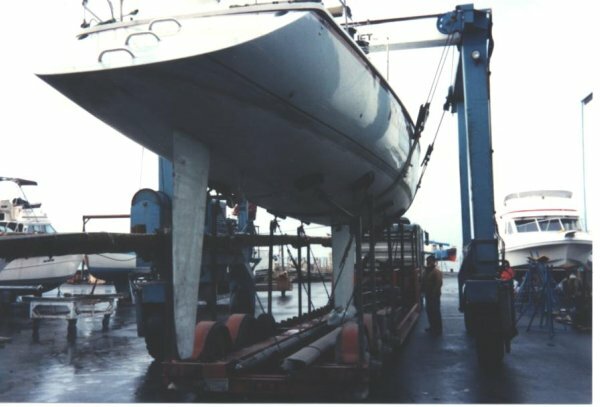 I had been looking at MAC65 for a few years and when a charter fell through for a boat from San Francisco I decided to buy a MAC 65 and charter it to our group. 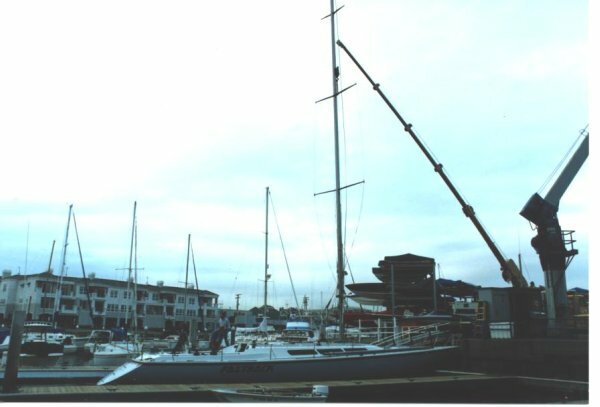 So this was my first view of MC FASTRACK, in Newport Beach California just down the harbour from Roger MacGregor, the designer and builder. The information on the MAC65 and her speed potential, waterline and comfort, unsinkability, and her reasonable sailplan were all attractive. After all, Fast is Fun. She proved to be very fast and sea kindly. 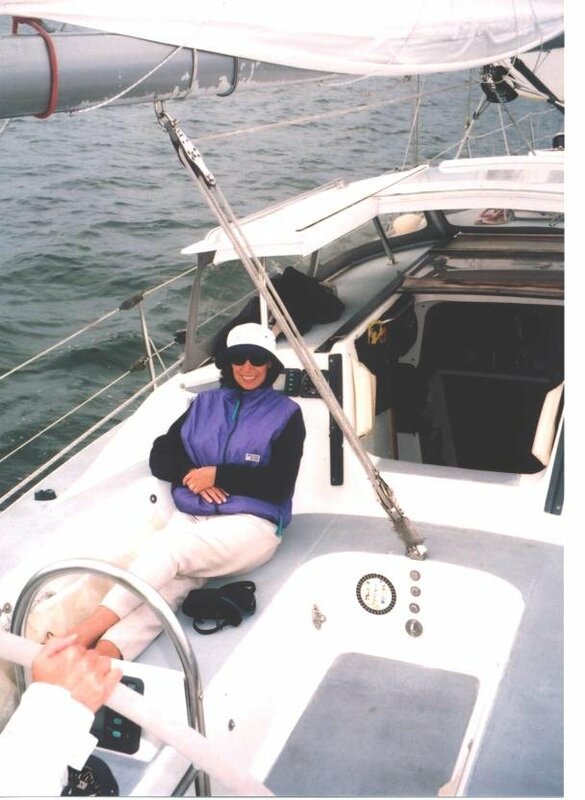 I singlehanded her one day and covered 51 nautical miles in 3 hours on a reach with main and cutter jib in 25 knots of wind. That's an average of 17 knots. Single-handed. I love it!! 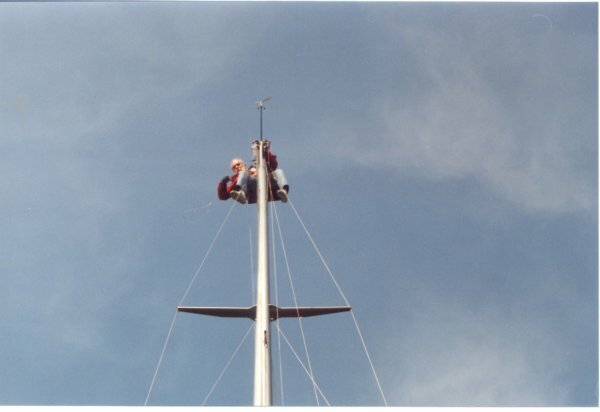 Even though she has a reasonable sailplan for her length and easily driven hull, going up the mast can be an adventure. Here I am part way up. All the way up makes me a little hard to see. Going up underway is even more fun. Here's a shot from part way up, enroute to Maui. If you play with your camera you can always create exciting shots by exaggerating things. 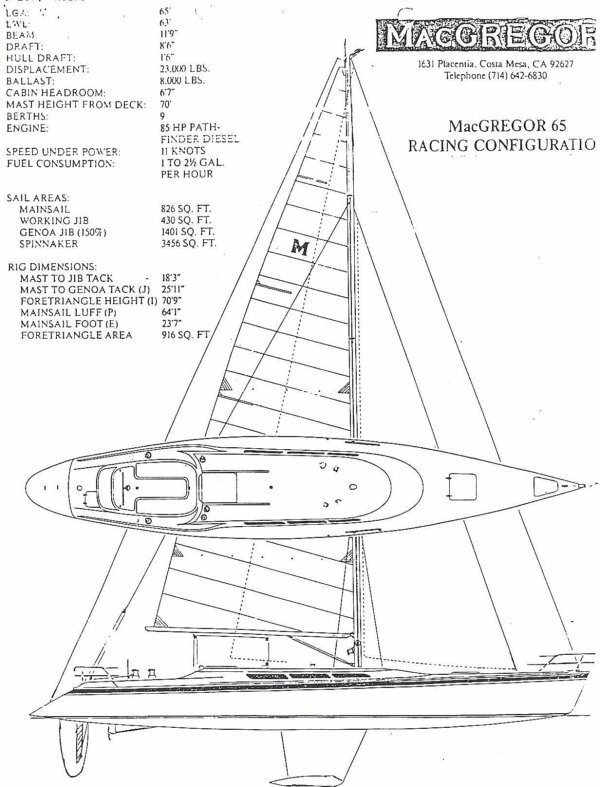 You do want to keep a boat as flat as possible and the BigMac, with its narrow beam, requires some attention to this. Lest anyone thinks the Vic-Maui is a warm water race all the way, check out the apparel. Big spinnakers rule! 2400 square feet , the size of a house. And you still want to keep the boat as flat as possible - with no lines hanging over her side. On a close reach with a spinnaker up most boats are going to heel. And that means more leeway and less speed. 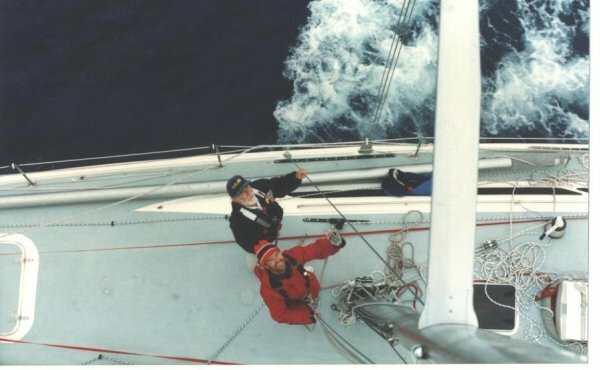 So here we are near the mouth of Juan de Fuca Strait heading to the open Pacific, running along very well before the wind, nice and flat and fast enroute to Maui. YES!!!!!!! You can almost always smell a landfall - reminds me of how we are always interconnected, at least by the air we share. Maui was no exception and we smelt the land before we saw it. 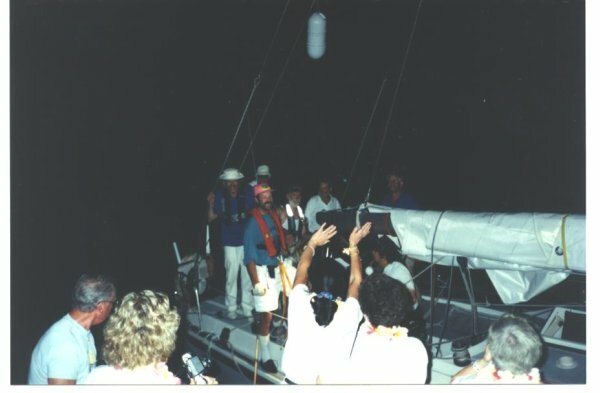 We finished the race just at sunset, and came alongside to be greeted by spouses and friends a few minutes after dark. And there was Marie-Claire with a big hug. How are these big boats moved around? They are built in Costa Mesa and while that's near Newport Beach it is not on the water. So Roger Macgregor would truck them to to Newport Beach or anywhere in North America. and put her on a trailer. 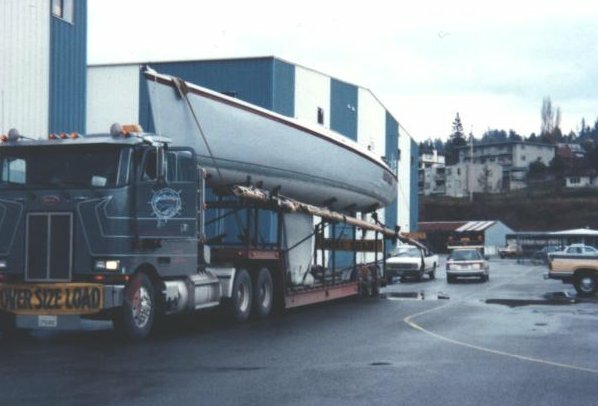 After several days driving up I-5 with people gawking at this 65 foot sailboat sailing up the freeway with 15 feet of mast sticking out astern, the truckers arrived in Blaine WA. 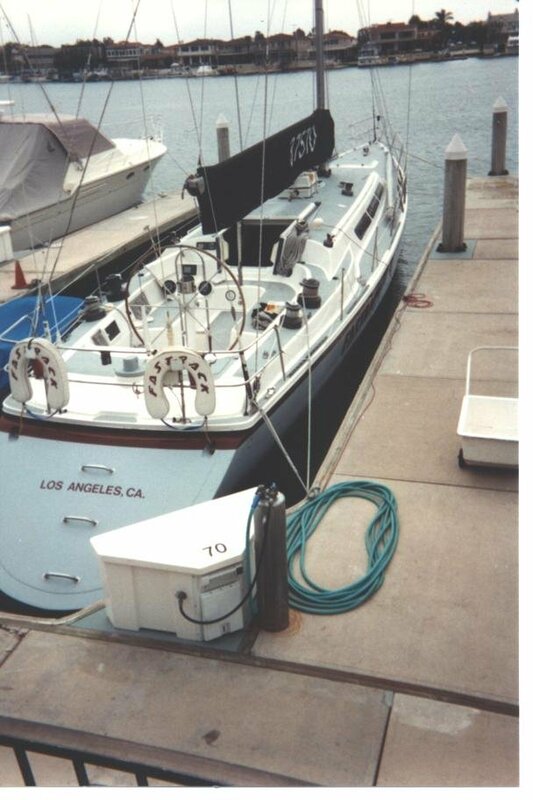 After returning from Maui we began a slow conversion so she would be more versatile for charters. 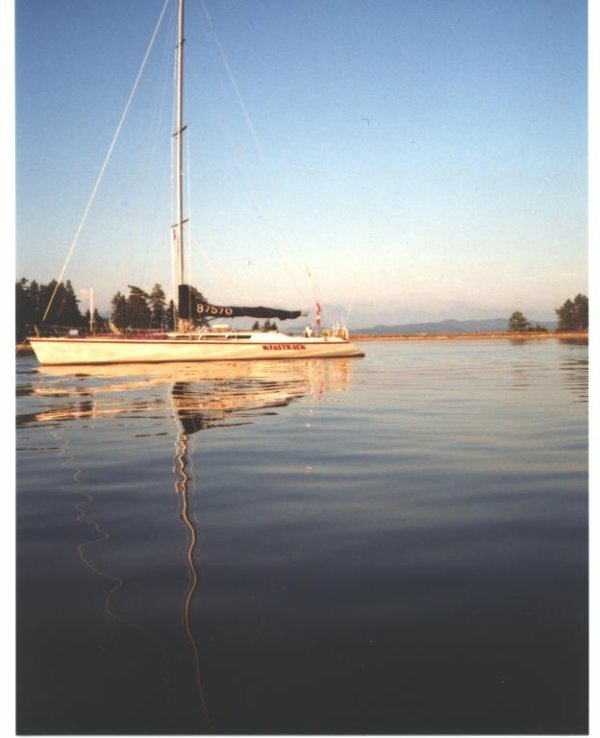 Here she is on a charter, anchored at Sydney Spit, before many changes had been completed. The bulk of the changes, apart from adding this dodger and later a 5 foot sugar scoop, were to the interior. 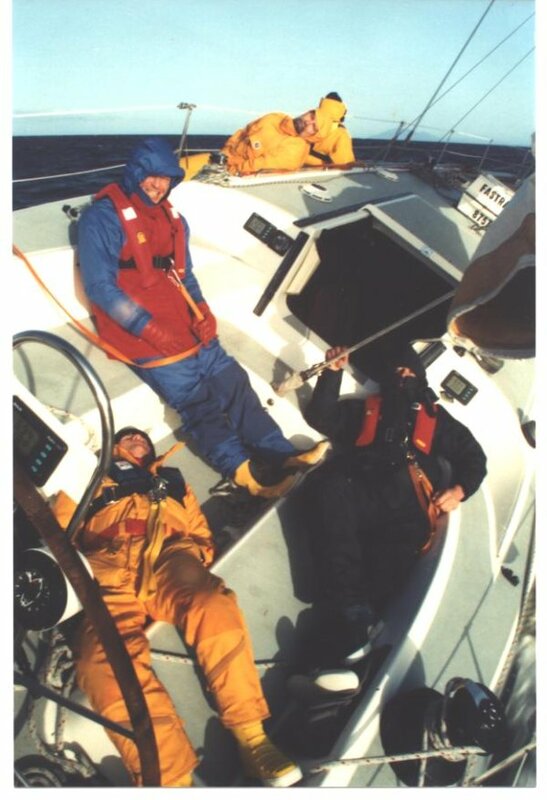 For chartering, comfort on deck is a serious matter. Having a good, strong dodger is key. 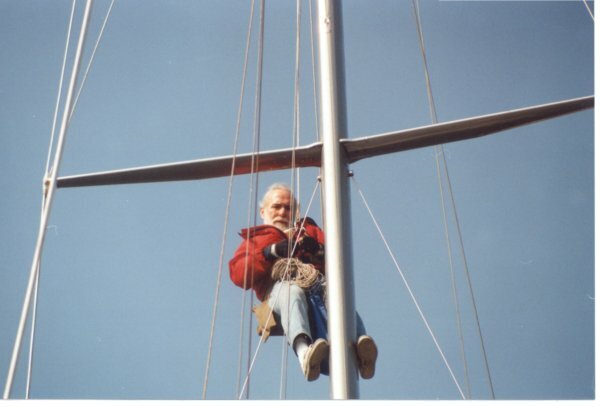 To be functional in a charter boat, or for taking diown a spinnaker, you want a sliding hatch in the dodger, the same size as the companionway hatch below it. Note the stainless steel handrail for going forward. 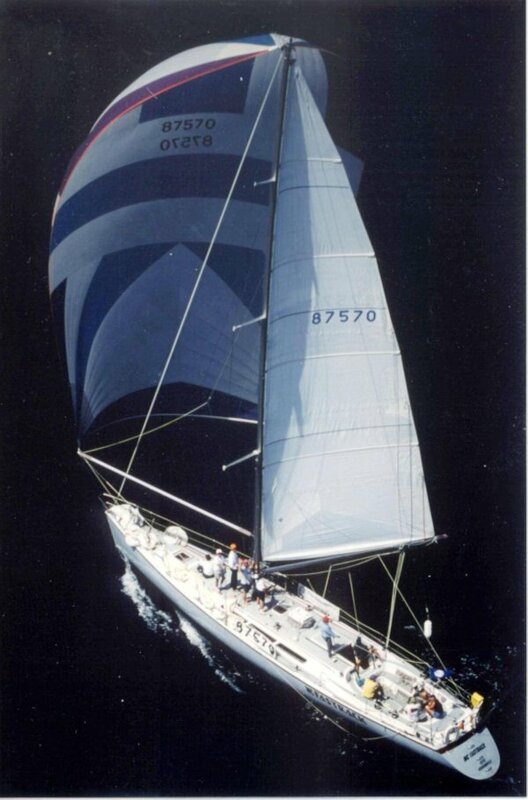 Our First Principal was that everything we added had to be removeable so she could be chartered again for racing. Our Second Principal was that everything we added had to be strong but light. In the end we added less weight than the racing sails we removed. For interior pictures click here. return to Roger Elmes by clicking here.